NEW YORK — To reinforce the proposition that Stan Laurel and Oliver Hardy were, and still are, sacred icons of film comedy, the pitch-perfect, affectionately nostalgic “Stan & Ollie” (Sony Classics) reproduces their 1953 arrival in Cobh, Ireland, during what would be their last tour of British music halls. Cynical minds might detect the workings of an adept publicist. But whenever Laurel retold the story, which he did often before his death in 1965, it was a spontaneous gesture involving “all the church bells” in the port city. The moment is out of sequence in the film, placed at the end instead of at the beginning of the tour where it actually occurred. But there it has more emotional impact in what amounts to a secular hagiography. One does not have to be a devoted fan to enjoy these references. “The boys,” as they were known in their prime, always worked clean, and this is one squeaky-clean tribute as well. 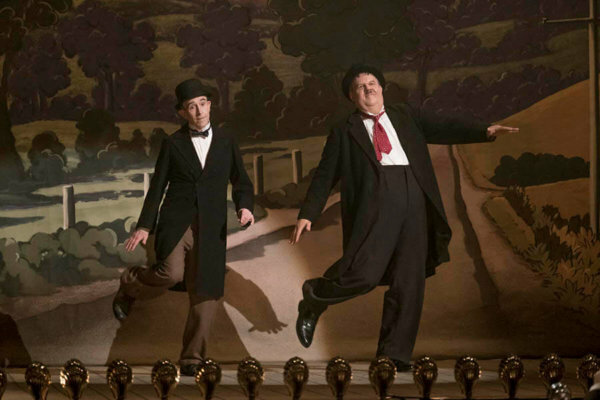 Laurel (Steve Coogan) and Hardy (John C. Reilly) are on what will be their final tour of Britain, during the waning days both of their careers and of the music halls — venues for the British version of vaudeville. Unlike most movie personalities who began in silent films, both had a background in live performance, and to British audiences they were a vestige of the innocent times before World War II. Over the years, they’ve learned to put all their trust in each other. Bernard Delfont (Rufus Jones), the producer of the tour, has booked them into second-rate houses. In Hollywood years before, producer Hal Roach (Danny Huston) refused to give them a share of their films’ considerable profits. They eventually deal with a simmering dispute from the time in 1939 when Hardy was compelled to work with another partner during Laurel’s contract dispute with Roach. Their wives, Laurel’s Russian-born Ida (Nina Arianda), a former dancer, and Hardy’s Lucille (Shirley Henderson), a script supervisor, are generally supportive and only occasionally bicker about their status. This leaves two obstacles: A spoof of the Robin Hood legend they hope to make under a vague promise from a British studio, even though both realize that their film careers are probably firmly in the past, and the obese Hardy’s perilous health. A heart attack eventually ended his performing days before his death from a stroke in 1957. Filling out the story are astonishing reconstructions, from Laurel’s scripts, of their stage act, which was never committed to film during their lifetimes. These two performers epitomized “the show must go on” work ethic, never disappointing an audience, no matter how small. The result here is not so much the belly laughs of their prime, but sublime joy at their invincible courage. The film contains at least one crass term. The Catholic News Service classification is A-II – adults and adolescents. The Motion Picture Association of America rating is PG — parental guidance suggested. Some material may not be suitable for children.